We are launching the brilliant Script for listing courses website that it supports multi-functionalities made a business concept. Readymade Course Listing Script enriches finding of your online courses with the undemanding process. It is a multivendor script that tutor can register themselves and upload their curriculum to the public users also might have theoption to set the availability time, fee and course details, mode of payments without any obscure. Students can search according to their needs also students may segregate the available courses based on the costing, based on their self-interest student pay and subscribe required courses offered. 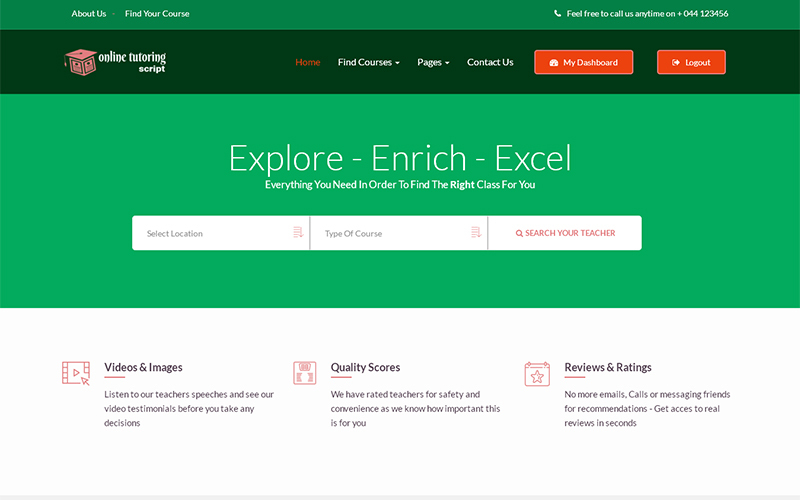 Also, students are eligible to give star ratings based on tutor guidance, through this review people are aware of the tutor and courses as well. Launch Study Course Listing Script video testimonials are integrated into listening to the classes visually and transcript images as well.Well recognized tutor are listed and tutor can manage students contact. In admin panel,tutor profile images can be updated for various courses.Admin panel can manage all profiles of Tutor Login Details, Student Login Details, Institute Tutor Login Details,and Institute Login Details. Faculty can list offered courses along with timings and student will schedule available timings and pay according to the fee. We have integrated different payment gateway, PayPal as the default payment gateway and can import CSV format to the script.Furthermore,we have five different payment gateway such as 2Checkout, Payaza, PagSeguro etc. Finding the intuition is pretty simple with our script it is deliberated as an additional advantage, you can search institution in such a way that category-wise, by location, also search a specific institution. Based on the result found students get personalized contact of each institute and enroll for their consignments. Php Training Course Script have a subscription plan that able to access for downloading lesson plans, as an LMS Script one can upload or download with pdf, video format to appropriate users who are subscribed to the classes. Our script supports high download speed to download the media files. Our Scriptis developed in PHP and MySQL, so it will support over millions of users in the database, optimized loading time and has SEO-friendly URLs. Last but not least, it is one of the greatest websites for theeducation industry. We will give you the entire source code for purchase and your Video Training Script will go live within 24 – 48 hours upon the delivery of the script. Lovely scripts by the team I might thank to all for delightful script to list all online courses. Wow! In admin panel, tutor profile images can be updated for various courses. Admin panel can manage all profiles of Tutor Login Details.